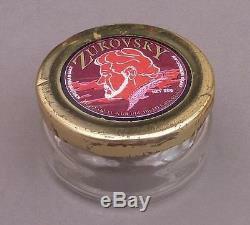 James Bond 007 The World is not Enough Original Prop Zukovsky Caviar Jar COA. This is a caviar jar seen at Zukovsky's Caviar Factory, It measures approx 3 Inches in diameter and is in worn condition. You can now follow StarZoneToys on Twitter and Facebook for all the latest stock updates. Any questions please see contact details below. We pride ourselves on our excellent customer service and reputation. Tel: 01754 765076 or mobile: 07739 355829. The item "James Bond 007 The World is not Enough Original Prop Zukovsky Caviar Jar COA" is in sale since Monday, June 30, 2014. This item is in the category "DVDs, Films & TV\Film Memorabilia\Props\Original". The seller is "starzonetoys" and is located in Skegness. This item can be shipped worldwide.